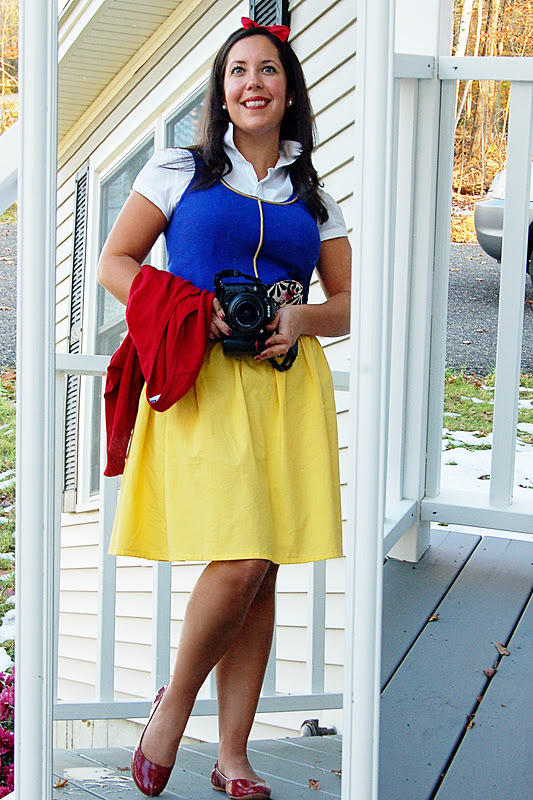 I was going for the 'modern-day' version of Snow White and tried to use items I already had, like the white collared blouse and the red cardigan. The patent red flats were purchased on sale at Target. As for the bow, I bought a red satin ribbon and hot glued it around a headband I already owned. 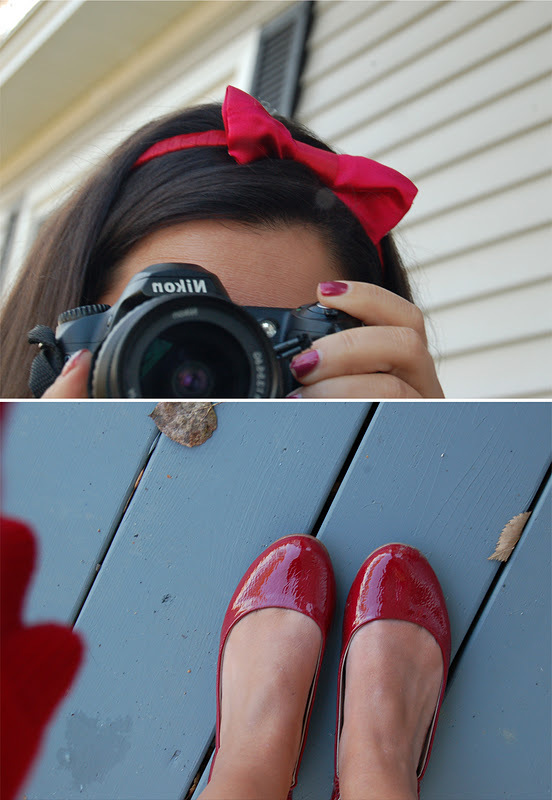 I used red satin fabric to make the bow, then glued it to the top of the headband. To achieve the bodice/princess look, I bought a $3 royal blue tank from WalMart onto which I hot-glued some gold roping (purchased at the fabric store). I used fray-check on the ends, too! As for the skirt, I found a really simple tutorial from MADE. All it took was a couple yards (OK, maybe less as I am only 5-feet tall and thus don't need a long skirt!) of yellow fabric and an elastic! An Evil Queen! Isn't Donna's costume AWESOME!?! She bought the maxi dress on clearance at Target and made her crown out of a gold gift bag. 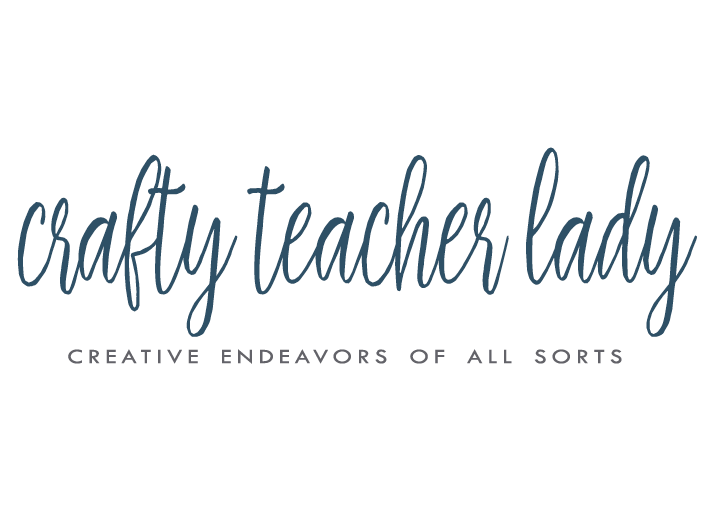 Her white collar is a toilet-paper covered disposable foil casserole dish that she cut! Her head is covered with a ski-hat thingy (which has a real name that I can't think of!). Add a cape from the Halloween store and a foil-covered mirror and voila! Needless to say, our students were quite entertained at the sight of their wacky History & Math teachers dressed as Disney characters! Happy Belated Halloween!